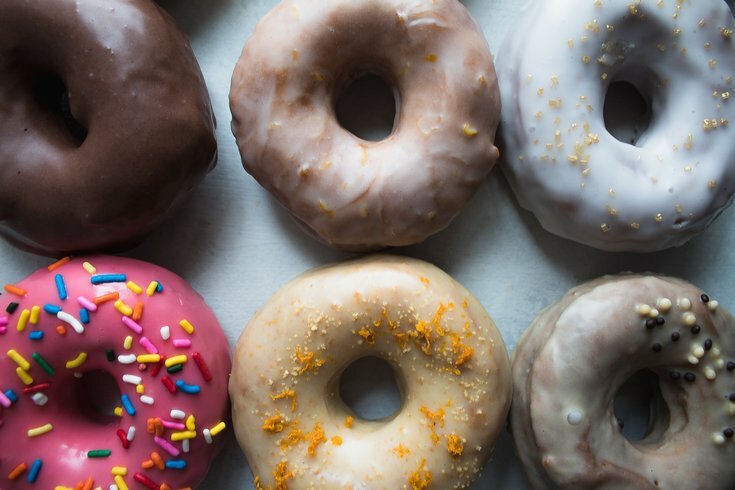 There’s somewhat of a secret donut society in Philly, and it goes by the name of Okie Dokie Donuts. There is no store front, just a building in South Philly. They’re only available on Saturdays, and you have to place your order two days in advance. It’s a slight bit of a quest. You get the address, stand outside the door and wait for Carol Ha, the owner, to come down and deliver the doughnuts. But after one bite, it becomes clear why so many people seek out Okie Dokie. With a delicate and yet thick layer of frosting that somehow balances the fine line of sweet enough without being overbearing, the flavor of each doughnut works with a light cake that goes down ever so softly. Started in 2012, Ha runs Okie Dokie through a rented kitchen. She does orders of half dozen or a dozen doughnuts as well as two dozen mini doughnuts. Every month, the flavors change. June’s flavors consist of chocolate, grapefruit honey cardamom, blueberries and basil, Vietnamese coffee, cherry vanilla pie and birthday cake. The highlight of these doughnuts aren’t just their mystery, it’s the fact that they’re gluten free – and good. Some people can squirm when they see the word “gluten free” next to anything food-related (unless that’s your jam, of course.) But fear not, these are not your paleo neighbor’s gluten-free baked doughnuts. Oh no. They’re fried, totally amazing, and do not taste gluten-free. To keep up-to-date with Okie Dokie Donuts, follow them on Instagram and check out the website, here.